Q. How do you print a PDF file full scale? A. Set the zoom on the monitor to 100% and move the drawing to the view you want to print. Use the pull down file and print buttons. In the print window use the print current view option and in the lower right corner it should show 100%. If not, set the page scaling to none. Print and verify it is full scale by measuring a known dimension like a dimension shown or a housing width. Q. What is the torque for the taper grip pulley? A. 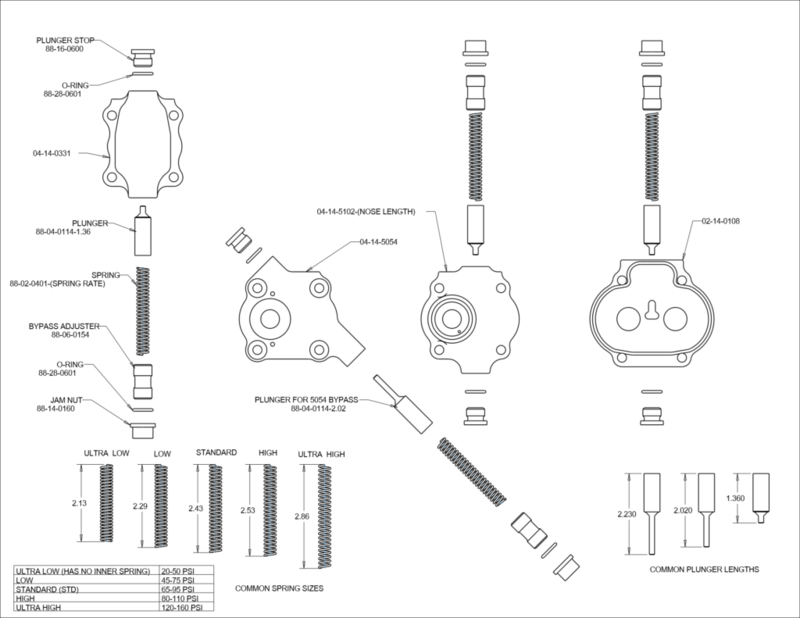 Installation Instructions for Dailey Engineering Taper Grip Pulleys *NOTE*: There are multiple sizes of taper grip hubs. Some use 10-24 socket head cap screws and others use ¼-20 socket head cap screws. For the purpose of this document we use the 10-24 as the example. The torque values should be adjusted for the ¼-20 screws as follows: 10-24 torque is (55 in/lbs).¼-20 torque is 90 (in/lbs). Remove the three (3) 10-24 socket head cap screws and clean thoroughly. 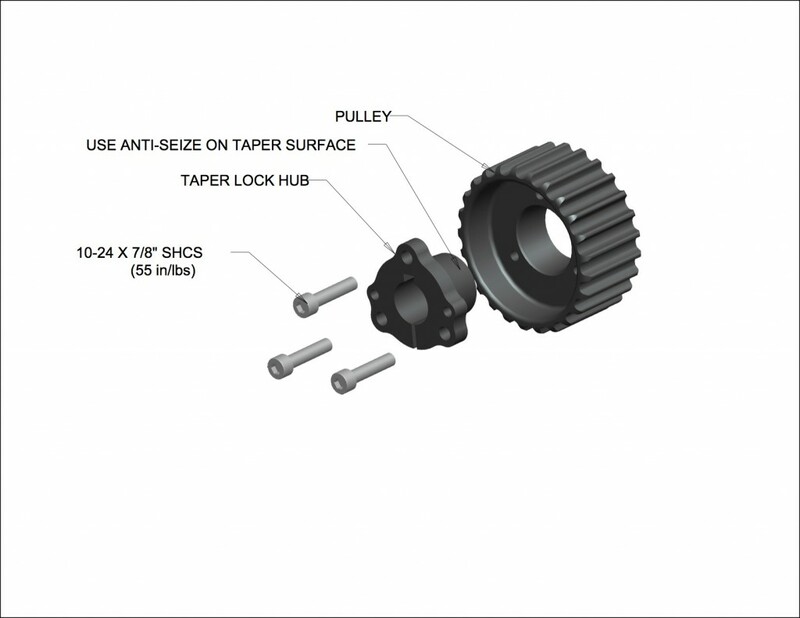 Remove taper hub and clean the taper in both the pulley and the hub, apply anti-seize (copper-slip or similar) to taper. 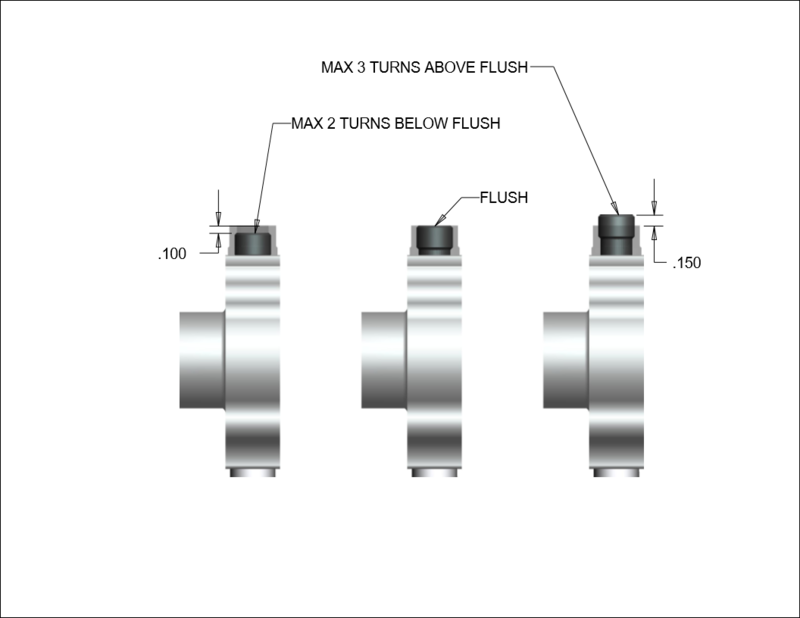 Clean the ID bore of the taper hub. Apply blue Loctite (#242) to the three (3) 10-24 socket head cap screws. Install pulley on oil pump shaft (shaft should be free of any burrs, scratches, oil or grease) and set position. Tighten the (3) 10-24 socket head cap screws in a circular pattern to a torque of (55 in/lbs). Repeat the torquing procedure until screws do not move at (55 in/lbs). (usually 3 times around). Do Not tighten the pulley with a belt attached or the pulley may not run true! Hold the pulley by hand while tightening to ensure it tightens correctly. Loosen the three (3) socket head cap screws. Tap with a soft mallet, if pulley and hub do not separate, use one (1) 10-24 socket head cap screw and thread into one of the threaded holes in the taper hub. Tighten screw until it separates the hub from the pulley. Pull the pulley assembly off of the shaft (with your hands, not a puller). Pulling on the pulley to remove it from the shaft can tighten the taper, making it difficult to remove the assembly from the shaft. With the pulley and hub separated, you can insert a small screwdriver into the slot on the hub, which will keep the hub from closing up during the pulling process, facilitating pulling the assembly off of the shaft. Q. What are the parts of the pressure regulator and how do I properly reassemble it? A. 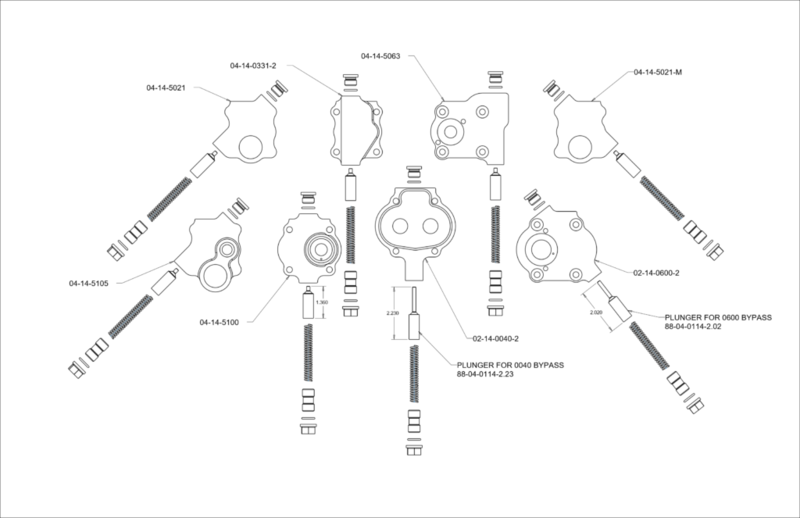 Below are some of our most common regulators and how they are to be assembled. Please note that the plunger length is specific to the regulator. Q. How do I adjust the pressure regulator on my pump? A. First you will need to loosen the jam nut with a 9/16″ wrench then with a 1/4″ allen wrench you will be able to turn the adjustment screw. 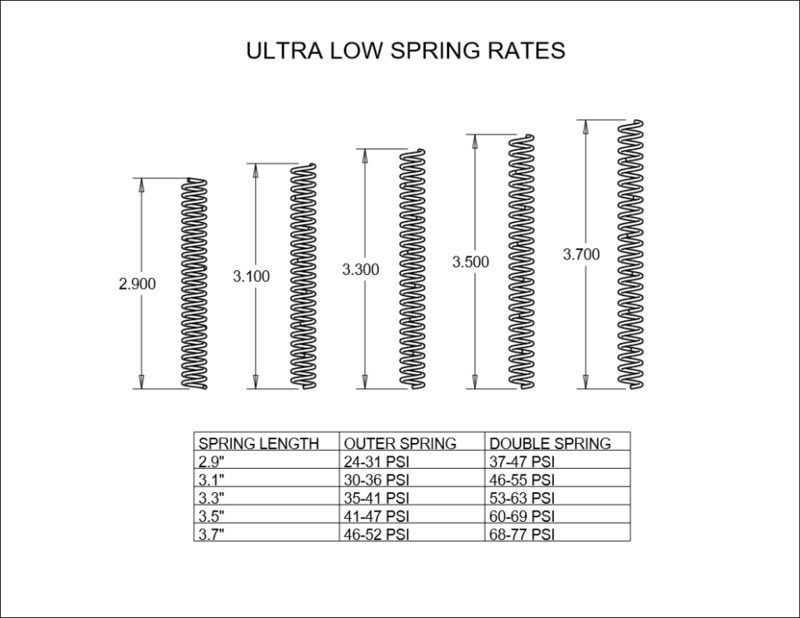 Each turn of the adjustment screw will change the pressure approximately 7 psi. *NOTE* This will only change the oil pressure at RPM not idle.